They have been together for more than twenty-five years. 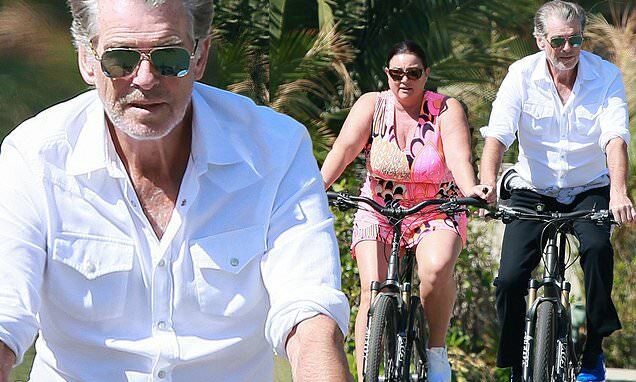 And Pierce Brosnan and his wife Keely Shaye Smith looked every inch the happy couple as they went for a romantic bike ride around Malibu, California on Monday. The Irish actor, 65, was dressed casually for the day out, donning a white shirt with his sleeves rolled up, dark trousers and a pair of shades. His other half Keely, 55, sported a pink mini-dress with a printed, multi-coloured pattern and box fresh white trainers. The couple first met in 1994 in Mexico and married in 2001 at Ballintubber Abbey in County Mayo, Ireland. Known for playing James Bond, Pierce starred in films GoldenEye, Tomorrow Never Dies, The World Is Not Enough and Die Another Day.